Things are looking up for Tony Chu, the cibopathic federal agent with the ability to get psychic impressions from the things he eats. He's got a girlfriend. He's got a partner he trusts. He even seems to be getting along with his jerk boss. But his ruthless ex-partner is still out there, operating outside of the law, intending to make good on his threats against Tony and everybody Tony cares about. It's just a matter of time before their investigations collide, blood spills and-inevitably-body parts are eaten. 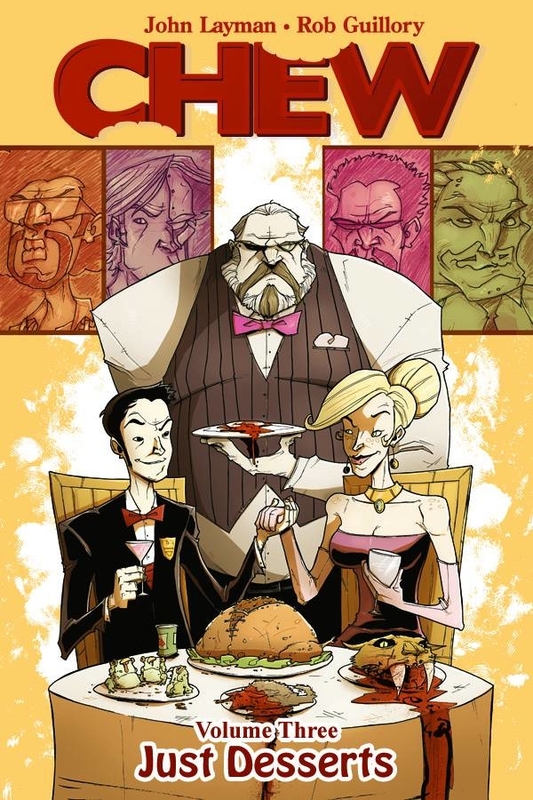 Presenting the third storyline of CHEW, the follow-up to the New York Times Best Sellers 'Taster's Choice' and 'International Flavor.' Check out the strange and darkly comic series about cops, crooks, cooks, cannibals and clairvoyants. Winner of the Eisner Award for Best New Series and nominated for Eagle and Harvey awards to boot! Collects CHEW #11-15..